"I am one with the Force; the Force is with me." So the the short version of the story is this: I love Rogue One. I really, really love it. I dislike trying to rank the Star Wars films, because they have different voices and purposes, but if I had to do so, this one would rank very high indeed. I'm really looking forward to tackling this in my "The Force of Star Wars: Examining the Epic" course next semester. I'm expecting some great discussions with my undergrads! I highly recommend reading the novel Catalyst by James Luceno, which is essentially the prequel to the film and directly relevant to its plot, and also the Rogue One novelization by Alexander Freed. I've quoted some of my favorite passages from the novelization that shed new light on the story here. I also recommend the Visual Guide. My favorite revelation from the book is (mild spoilers!) 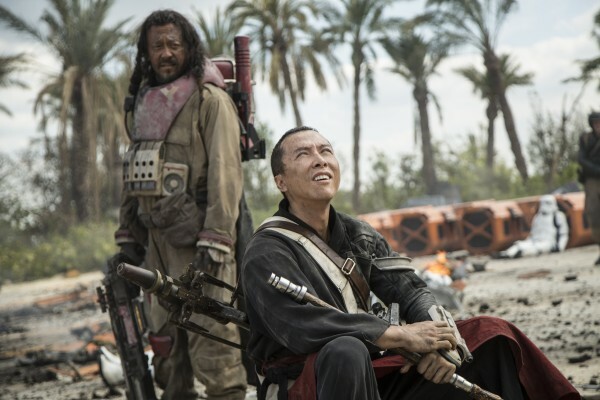 that the red sash worn by both Lyra Erso and Chirrut Îmwe is known as the Red Sash of the Enlightened, marking them both as related to the Jedha sects of the Church of the Force -- not Jedi, but believers and protectors of Force knowledge in the galaxy. That fits neatly with what we already know of both characters, but I like the visual symbolism. Last, Rebel Force Radio's brand new episode of the Star Wars Oxygen series, which explores the scores of Star Wars with music professional David W. Collins, begins an eye-opening (ear-opening?) analysis of the Rogue One score. Terrific stuff. I'm also really excited about the novelization that supposedly came out Tuesday. There are some fantastic passages in it that really add a lot, IMHO. loving it is high praise indeed! Supposed to see it on Sunday! YAY! I still haven't scratched the itch. I need to see it at least one more time in the theater, LOL. Violence disturbs me, and it may have even disturbed me more that this violence was not bloody. My grandson cheered the heroes on .....the heroes whose methods were questionable to me....and I think that was a very conscious choice of the film-makers......an honest choice, to be sure, but I have to be concerned, then, that my naive grandson is not seeing what I'm seeing......Does a righteous cause justify *any* means? Oh, I know: it is only a movie. And yet.....it is not. It matters. Your mileage may vary, of course, but what you've pointed out is one of the reasons I loved this so much. Here there are no chosen ones or pre-destined heroes. War is messy, and it takes a great toll on those who wage it, and I really appreciated how the characters -- real characters, flawed characters, fallen characters -- found themselves pushed over moral lines they'd once drawn, because that's what real war does. There are clear historical models for the Cassian Andors of the tale. The moral of the story is all the more poignant, I think, because these characters each ultimately choose sacrifice and find personal redemption in that choice. In short, I think there's more hope in this film than in any in the franchise to date. I especially appreciate how there's an extended metaphor across the Lost Stars and Catalyst novels, brought home with emphasis in Rogue One, between the creation of the bomb and the Death Star. The fact that Galen Erso, the Oppenheimer figure, finds a way to strike back at those who militarized his scientific research hits a very positive note, I think (despite the fact this doesn't exactly help those on Alderaan). But hey, that's just my two cents. If everyone agreed, it wouldn't be Star Wars! well, in fact, i do agree. and yet......i guess the reason i am quibbling is because of my grandson, who doesn't have as yet, the ability to see that the Rebels shouldn't be ....well, deified. No, you and I see that, we see the moral conundrums, the very *honesty* of this telling vs the old telling. But all he sees is good guys/bad guys. But.....this is always how I have been: seeing both sides and finding them both wrong. But that is what the human condition truly is, i reckon. The rest is just a kindly fairy tale. If it weren't for the two farthings that we all have to share, this would be a very one-way-world. And that should not be. My news feed just told me about Debbie. Oh, what a heartbreak. this is too much. ...i guess the reason i am quibbling is because of my grandson, who doesn't have as yet, the ability to see that the Rebels shouldn't be ....well, deified. I see what you mean. And I'm afraid I don't have much useful to say here. I wasn't very good with children when I was one (ha, understatement! ), and, learning my lesson, I've had limited exposure since. I figure I'll wait 'til people are at least eighteen before I get very much involved. ;) So I'm unqualified to comment. But that said, I always found when I was young that an honest conversation went a long way toward helping me see the gray between the black and the white. Even if I didn't "get" the full picture until later, the conversation stuck with me, and that mattered. I do remember as a young thing being deeply perplexed and concerned about why Obi-Wan might have lied to Luke Skywalker about his father. It was a loooong few years between Empire Strikes Back and Return of the Jedi, and I was shaken by the idea that the mentor might have misled the student. Much angst. Many conversations. Oh, my poor parents (she thinks in retrospect)! It is tragic, isn't it? I feel so much for Carrie's brother/Debbie's son and Carrie's daughter/Debbie's granddaughter. Either loss would be so much to handle, but both? By the way, if I haven't said it lately, thank you for your friendship. You are a treasure and a blessing, and I'm most grateful that we've stayed in touch. what has proved true for me: when you are actually raising the little errrr.....Daleks.....you are having these honest convos and you are thinking how great it is going, (or sometimes not, as is the case when they become teenagers, usually: you remember! ).....and then, proof-in-pudding-wise, you find out that you might have been wrong. There are so many factors that go into a human being. You, for example, enjoy the strange, the macabre.....the visceral, even. For want of me really *knowing* you, I would apply that Sally Sparrow quote that says that sadness is 'happy for deep people'. You have turned the dark into a sort of light, taken what is valuable and 'deep' from it. But, having seen my own children grow up, having seen the reap-age of (at least part of ) my sowing, seeing how in love with violence the present world is, I worry that young minds, no matter how honest a convo is there, will not go down the path of thinking before doing. Every child is different, every *raising* different. And you can't, to a great degree, control the thousands of variables. So, i wonder, and am afraid at the accepted portrayal of violence in our lives...at the actual violence in our lives. Yes, these things are all chances for a parent to sit down with a child and talk about what they've seen, what it means, what it *should* mean. But how many parents do that? I'd be willing to say.....not very many. The hindsight of grandparents (who can see their own misfires) is 20/20. Not so much when you are *in* the process. Ai, well, life will continue; children will grow into adults and the world will change. And then it will change again. And again. We will learn. We will fail, we will succeed. We will be stoopid and we will be wise. (it would be interesting to know if your parents remember those conversations and, if so, what their take is on them. (if your parents have departed, I apologize)). Re Debbie and Carrie: I saw Todd on tv last week and he seemed very, very composed. Maybe he actually *was* composed; perhaps that is his nature. But, remembering the calm that I had when my father died, it could be that he is in that bubble-wrap of shock that keeps us a bit safe until we can take in the concept of such a tragedy. Nevertheless, it is impossible to imagine what the family is going through. My heart goes out to them. I saw this the other day and really really loved it too - I want to see it again already! Totally got me excited about SF again, just like Star Wars originally did. Well, that was more a continuation/encouragement, but still! I shall have to look up the novelisations if you recommend them too. I know exactly what you mean. I've seen it several times and I want to go back yet again! It's been ages since I felt this way about a film. And it's the most SF-heavy of the Star Wars movies to date, I think, which I find to be thrilling. I'm soooo glad you loved it, too! Just remember that it's not Rouge One.